Unlike many of the UK's festivals this year, the Cambridge Folk festival actually had good weather - there was sunshine, the site was green and grassy (rather than a muddy swamp as some festivals had), and it was lovely and warm. That sort of weather always helps put people in a good mood for a festival, and that good mood was apparent everywhere you looked. The first thing to strike me when I arrived was the age range of people there. There were quite a few elderly people enjoying the music, as well as middle aged people, youungsters, teenagers, and lots of families with small children - the festival really does attract a mixed crowd, and the atmosphere was a really good friendly one as a result. The arena is a small compact site with the main stage having a covered area as well as the outside viewing area, a second stage, a club tent and a smaller stage (The Den) that I didnt actually manage to visit during the day. The area in front of the main stage was a sea of camping chairs - something you dont see much of at the rock festivals I usually frequent. One of the most important things at a festival (apart from the music obviously) is the food and drink arrangements, and in that area Cambridge Folk Festival certainly does well. The main bar is a decent size and was well staffed and more importantly sold a good selection of beer and cider with real ales and proper cider available - none of this typical festival rubbish were you get one choice of mass produced cider and one average lager, no, here you get real drinks. Needless to say, with Crabbies sponsoring the festival then their alcoholic ginger beers were also on sale, including a rather delicious orange version. Sadly having to drive home that night meant being responsible and only having one drink in the early afternoon. Now I see why most people seem to camp at this festival! In terms of food, I was expecting the same selection of catering vans as you get at most festivals, so again I was pleasantly surprised - there was actually a much more interesting selection of food, and the quality was good. The burger van was from a proper farm that sells quality meat, and the burgers were really good - a lamb and mint burger with the mint in the burger, a pork and stilton one, again with the stilton being part of the burger, and a quality beef burger meant they were doing a roaring trade - not surprising as these proper quality burgers tasted so much better than typical mass catering burgers. Other food stalls included fish and chips, pizza, Greek food, Mexican food, Indian food, Oriental food (including some pretty hot and spicy items), and vegetarian & Vegan food, so there was a good range, and I noticed all the stalls being kept busy by hungry festival-goers. First up on the main stage were The Mighty Doonans, a band from the North East, who include several members of the DOonan family in the rather large lineup (if I counted right there are nine of them). With so many members then there were plenty of different instruments in use - guitar, bass, keyboards, saxophones, irish pipes, fiddle, and probably one or two more I've forgotten. Some of the songs were definitely folk songs from the North East - and the use of slang meant they had to translate it to explain to the audience what it meant before they started playing it. There was a definite Irish sound to some of the music, and we also got some Irish dancing from one of the female band members with heavy shoes being used on the boards to get a good sound for the microphones to pick up - the dancing was there as part of the music rather than just being visual. Different band members took leading roles during different songs or parts of songs, which was good to see. They included one song that I knew and I think most of the audience also knew - a cover of The Kinks song "Dead end street". I definitely enjoyed The Mighty Doonans - a good start to the days music. Next up were Spiro. Their set was instrumental and really didn't appeal to me that much I'm afraid, but certainly they seemed to go down fairly well with the crowd. 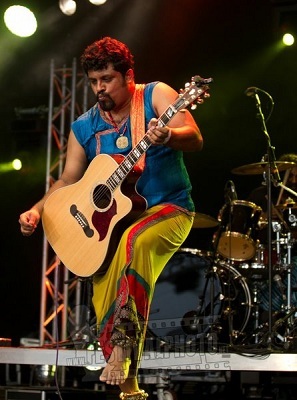 Next up was Raghu Dixit. An Indian singer-songwriter he has played festivals including Glastonbury. He and his band were very visually striking with their bright colourful Indian clothing, and as soon as they started playing, it was clear that the music was going to be equally striking. The music is an interesting mix of folk, rock and Indian music and was nothing like what I'd expected to hear at a folk festival, yet he fitted into the lineup perfectly and went down very well with the crowd. It certainly showed the diversity of acts that this festival puts on. Raghu Dixit put on a very entertaining set and his between-song banter was fun. Really entertaining and well worth seeing. Following Raghu Dixit was "Four men and a dog" (really 5 men from Ireland), and they played a good set of Irish folk music which went down well with the crowd. June tabor and Oysterband was up next. She certainly had a great voice, and while musically it wasn't my personal taste, it's clear the whole band were very good at what they do, and June's voice certainly impressed. Next for me was a trip over to the second stage to see Gretchen Peters. I'd reviewed her album a few months ago, so I was looking forward to seeing her play live to see how she compares to the album. The set was based mainly around latest album, with songs including "Hello cruel world", "The matador" and "Idle wild" with a few other songs included too. It was a great set. It was all kept simple - just her singing and playing acoustic guitar and her partner doing accordion and keyboards, and that simplicity allowed the vocals to shine. One of my highlights of the day. Next up on the main stage was James Vincent McMorrow, who seemed to get more credit for his beard than for his music. I personally found his set a bit boring really with everything at the same level and with little variation to add any interest. John Prine was next up. An American folk/country singer, his vocals seemed quite unclear - almost mumbling which I felt made it hard to really get into his music. Again it wasnt a particularly exciting set, although he did get a few guests including Gretchen Peters on stage for one song which certainly brightened things up. After that it was time to dash across to the second stage to see the Pine leaf boys. - Hailing from Louisiana they play Cajun and Creole music (more intersting diversity in the festival lineup), and very entertaining it was too. The music was great with a good fun feel to it, and they were entertaining to watch too. 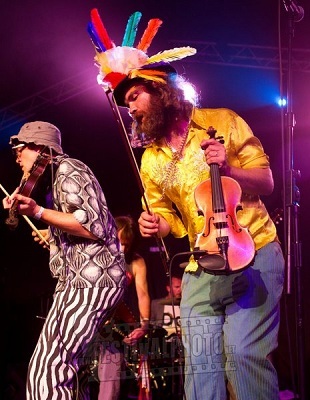 After their set it was time for the main stage headliner - Treacherous orchestra. They a Scottish band packed full of members - eleven of them in fact, so it's a good job the stage is a decent size or they'd never have got them all on. With instruments including bagpipes, fiddle, accordion, drums, banjo, guitar, flute and more then the music was never going to sound boring. It was definitely an interesting sound, which went down very well with the crowd, but all too soon I had to shoot off to see the final band on stage two - The Destroyers. The Destroyers made Treacherous Orchestra seem small - there were fifteen members of the Destroyers on the small second stage (I think it was 15 anyway - they never stand still long enough to count accurately), and they barely managed to fit on the stage. I had no idea what to expect from the band, but it certainly wasn't this. They were absolutely amazing. It was high energy madness really, with instruments as diverse as the Hurdy Gurdy being played alongside trombone, fiddles, guitar and much more. This really was an entertaining way to end the day, and we left with huge smiles on our faces after the fun of seeing them play. Another highlight of the day, and a great way to end the day.